You are currently browsing the tag archive for the ‘Downtown’ tag. Louisville Metro Public Health and Wellness has released the “State of Food” report for the city (PDF link). 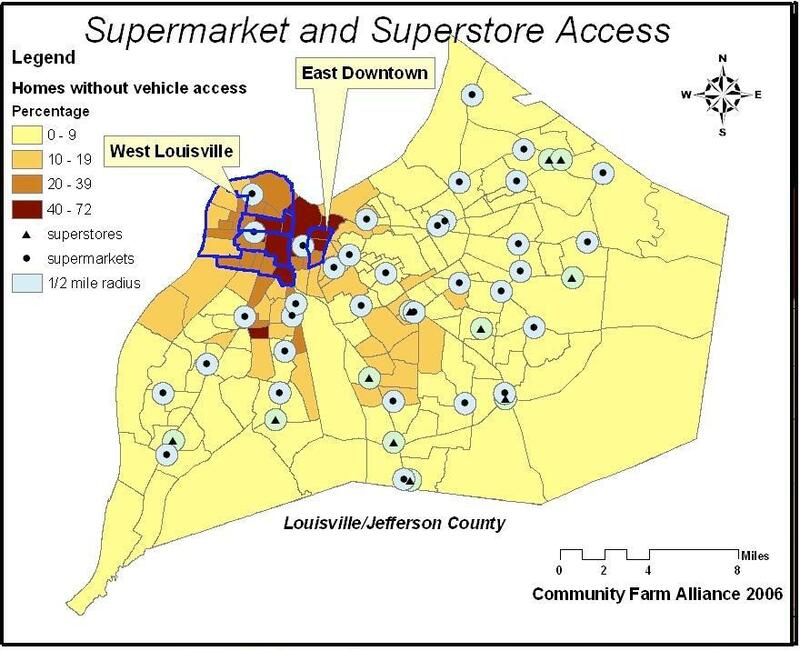 The report finds large food deserts in west Louisville and east downtown. These are areas where fresh food is hard to come by. Further limiting access is the fact that many households in these areas do not have vehicles, making a trip to one of the few grocery stores more difficult. Although West Louisville and East Downtown lack supermarkets, they have a tremendous amount of access to fast food. The report indicates that along Broadway, which runs from East Downtown to West Louisville, there are a total of 24 fast food restaurants in a 2.8 mile stretch, the highest concentration in the state of Kentucky (Figure 2).21 Interestingly, this report even finds that first tier national supermarket chains sell lower quality goods in low-income neighborhoods.22 In addition to being underserved by supermarkets and grocery stores, West Louisville and East Downtown residents also have significantly less access to a vehicle than residents of other parts of the city. In Jefferson County as a whole, only 13% of households lack vehicle access. However, 28% of West Louisville households do not have access to a vehicle and a striking 51% of households in East Downtown lack vehicle access. The report further discusses local food initiatives and programs designed to stock fresh food in convenience stores. What are your thoughts on alleviating food deserts? To touch on a previous topic: neighborhoods in the deserts–including downtown–do not follow the federal government’s definition of livability, because it is not possible to access grocery stores without a motor vehicle. The controversial Iron Quarter project has been updated. Developer Todd Blue detailed his new plans for the land and buildings at First and Main Street in the Courier-Journal. Blue’s attorneys recently told WFPL that Blue had always planned to preserve the facades of the original buildings (mock-up here), and the updated project highlights that intent. But saving the facades will not necessarily please preservationists. “Many preservationists believe that saving just the facades is not really preservation,” said Bob Griffith, president of Preservation Louisville Inc.
Blue said keeping the buildings intact isn’t feasible — he estimates it would cost at least $5million to preserve them, and he challenged any preservationists who want to save the buildings to buy them from him. With the Iron Quarter block in danger of being demolished, preservationists from all corners of Louisville are speaking out. Two organizations leading the effort to save the Iron Quarter are sponsoring a walking tour of the block this Sunday. Preservation Louisville and the Louisville Historical League will be hosting a walking tour of the Iron Quarter block threatened with demolition in Downtown. The groups will meet Sunday, May 16 at 2:00 PM at the parking garage at First and Main Streets. Admission is free for members of either organization, but anyone can go and sign up at the event. Individual membership is $35 for Preservation Louisville and $20 for the Louisville Historical League. Membership for students and seniors is $15 for both. A new coworking space has opened on Main Street downtown. Icebox Co-Labs is a collaborative workspace for independent and freelance workers. Co-founder John Wurth sent the press release out this morning, touting the space’s amenities. IceBox Co-Labs features a 3000-square-foot shared office space, a 3500-square-foot mixed use room, and a separate 1500-square-foot space housing the FLD recording studio. The office space will support up to 22 coworkers with access to the mixed use room for private meetings. “By pooling resources through a coworking model, freelancers can afford the space and equipment necessary to compete with much larger, better-financed companies,” explains Steele. There’s a grand opening later this month. What do you think? Are you an independent worker who would like a workspace that isn’t your home or a nearby business? It’s been reported and confirmed developer Todd Blue applied for a permit to demolish the Iron Quarter strip of buildings on the 100 block of Main Street downtown. Blue purchased the buildings in 2007. Mayor Jerry Abramson is reportedly opposed to the buildings’ demolition. Business First reports that Blue was unable to find a tenant for the space. The developer had hoped to land Humana Inc., which had been exploring an expansion, as the anchor tenant in what was proposed as a $50 million development. But that deal never materialized, and the project never happened. The buildings have fallen increasingly into disrepair, causing concerns about safety and their appearance, given their proximity to the $238 million arena, which is scheduled to open in November. Several weeks ago, the city erected a fence around the structure to protect pedestrians. [Blue’s attorney Glenn] Cohen said his client has no plans to sell the buildings, adding that Blue believes the block has great redevelopment potential, particularly with the arena getting ready to open. The attorney said Blue would like to save the buildings’ facades but was unsure whether they are salvageable. Cohen said the developer is “exploring a number” of options for the property and has “pretty exciting” mixed-use plans that he’s not ready to share. The cost of demolition has not been determined, Cohen said. Clearing the site would take three or four months. Jim Host, chairman of the Louisville Arena Authority Inc., said it would be bad for the arena if Blue’s buildings remain in their current condition. “Anything is better than (leaving the buildings) the way they are,” he said. Last month, Broken Sidewalk reported on a study that estimated the buildings could be salvaged for about 3 million dollars total. These numbers are rough and might seem high, but it’s important to remember this small investment today could pay off not only in public safety but in future investment. The value of over half a block of buildings adjacent to the arena is far greater. The options include stabilization techniques that do not require crews to enter the buildings so as to avoid current structural issues and could safely extend the buildings life by five years while the economy improves and a new plan is put in place for the property. Known in the preservation community as “mothballing” a historic building, the process is a good way to save unused buildings from collapse or severe decay. One proposed facade stabilization technique in the report involves braces that would buttress the building, extending diagonally from the facade to ground level and allowing sidewalk access underneath. In the end, however, Cobalt Ventures must make the decision to stabilize the Iron Quarter buildings. Todd Blue notes that the DDC study is preliminary and wasn’t conducted by Cobalt Ventures. He says he personally doesn’t know the condition of the buildings and doesn’t want to undertake any effort that might result in a potential collapse. I didn’t know there was an International Downtown Association, but the group is real and they like Louisville. The IDA names Louisville’s downtown Downtown of the Month, citing new buildings and attractions. The next time you drive around downtown Louisville, take a good look around because chances are, it won’t look the same just a couple of months later. Downtown development in the Derby City is booming with new announcements coming out every few weeks – the new downtown Louisville Arena, a new skyscraper, new and updated hotel rooms, museums, and several retail centers with shops and restaurants… just to name a few. Now, in keeping with one of the hottest nationwide trends, Louisville is adding a wide variety of exciting new housing opportunities and styles to its downtown developments. With more than $2.1 billion in construction occurring in Louisville’s downtown, the streetscape, level of amenities and quality of life is rapidly changing. The number of housing units has doubled in the last 20 years, with 900 units available in 1985 and more than 2,100 units available today. Those numbers are expected to double yet again within just the next three years, with 4,000 downtown housing units built, under construction or in development. Mayor Jerry Abramson is breaking ground on two new parking garages downtown at 4th and Chestnut. The press conference is in what used to be a parking lot behind the Henry Clay, which, as it happens, is where a few WFPL staffers used to park. 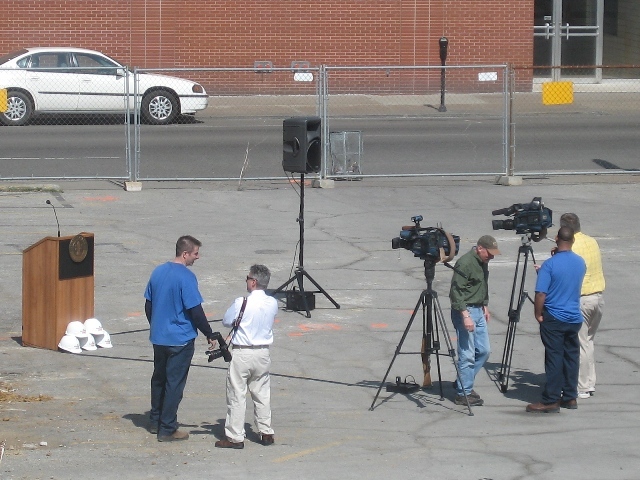 Here’s a picture of the setup taken from Louisville Public Media headquarters. Notice the pile of hard hats next to the podium. For the past few days, there’s been work going on in the buildings just north of the Theater Square Marketplace building in Theater Square. This used to be Songs For Seba and Cafe Kilimanjaro. Songs For Seba is now in the Highlands at Bardstown Road and Ellwood, and for the past few days, there have been workers inside the now empty building on 4th Street. Now there’s a sign up front saying the work is being done by Buffalo Construction. The Kilimanjaro and Seba buildings are in an L shape, with a hut between the curb and the Kilimanjaro entrance. 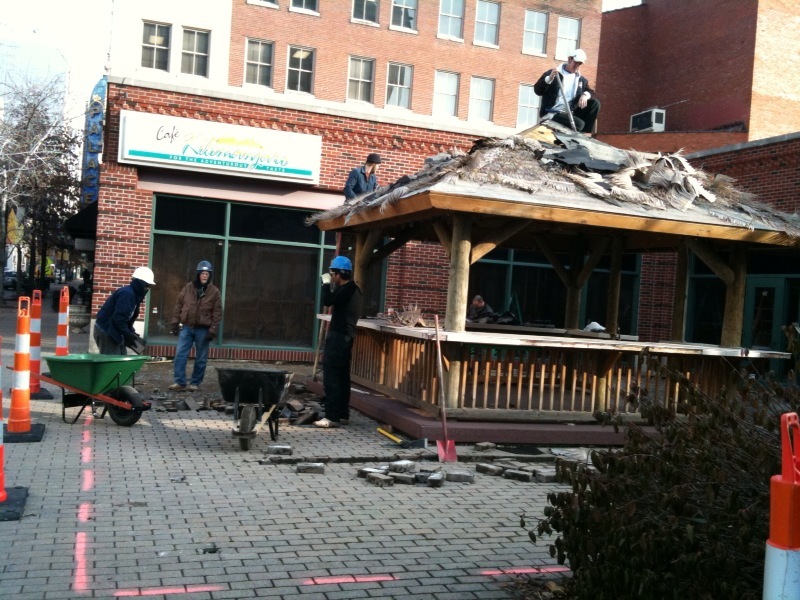 Crews were out this morning tearing down the hut and lifting up the bricks on the patio. It appears they may build out the L into a continuous storefront. Robin in the newsroom tells me Sapporo is moving into the space. This is another piece in the development of the Theater Square area. Directly south of Kilimanjaro is the Theater Square Marketplace, which opened in August. Back then, I asked the developers if they were concerned about being in between two empty buildings, and they said they weren’t; construction will come soon enough. South of the Marketplace is the Ohio Theater, which was a Cricket Wireless store, but closed last year. According to the electric sign in the window, that space will become the Ohio Store and sell phones and tobacco, among other things. Across the street, the Yafa Cafe is still open. And despite being a few hundred feet from Safier Mediterranean Deli, Yafa looks to be consistently busy at night. The Bluegrass Brewing Company usually has a healthy crowd for shows at the Palace and happy hour. But does anyone venture down to this area from conventions or 4th Street Live?